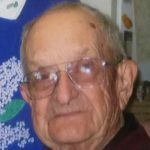 Jacob M. Haag Jr. passed away April 6, 2019, at his home at the age of 94. Jake is survived by his wife, Barbara Haag, three children, five grandchildren, and seven great-grandchildren. Jake was a WW II veteran, serving as a paratrooper in the 11th Airborne in occupied Japan. Visitation will be held Friday, April 12, from 5 to 7 p.m. A service will be held on Saturday, April 13 at 11 a.m. followed by a luncheon. Both the visitation and service will be held at Norvell Community Baptist Church, 2014 Commercial St., Norvell.